We have a great deal to make savings at Giant. 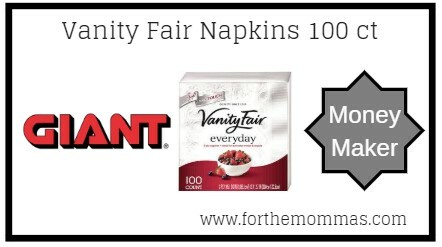 Vanity Fair Napkins 100 ct is priced at $2.00 each. In addition to this price, we have a $1/2 Vanity Fair Napkins coupon insert available to stack with this deal. Plus, you can earn $10.00 in gas reward points to make the final price Free + Moneymaker. Note: There is a $25 purchase requirement for gas rewards offers.